Top Gun Tactical Weapons is happy to announce it’s new line of apparel. 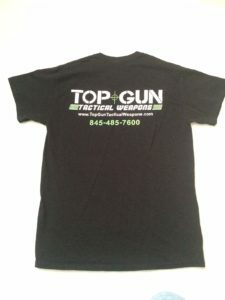 We are now offering top quality Gildan brand Top Gun logo shirts and hats. If you are looking for an awesome comfortable shirt to wear or hang around in these are for you. We are selling them at the lowest possible price and shipped free to you. We have three styles to choose from. 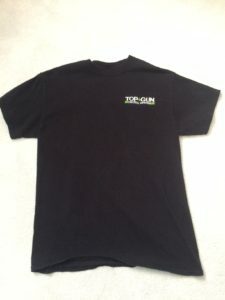 Our Embroidered T-Shirt is a Gildan brand, cotton, short sleeve shirt that is fully embroidered with our Top Gun Logo on the left chest. It is a lightweight and comfortable shirt that can be worn at anytime. 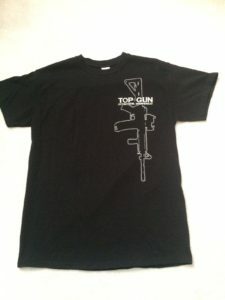 Our Printed T-shirt is a full vertical screen printed AR-15 with the Top Gun Logo placed over the upper section of the AR, A great way to show your support for the second amendment. 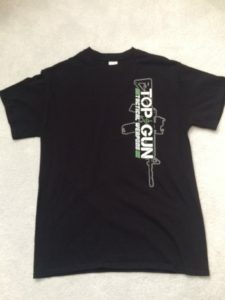 Our Screen Printed T-shirts have the Top Gun Tactical Weapons log and contact information printed on the back. Our Vertical Printed T-shirt is also a full vertical screen printed AR-15 with the Top Gun Logo placed over the AR-15 vertically, Another great way to show your support for the second amendment. 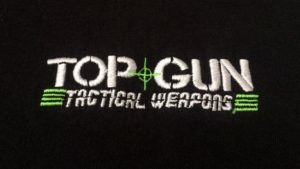 Our Screen Printed T-shirts have the Top Gun Tactical Weapons log and contact information printed on the back. 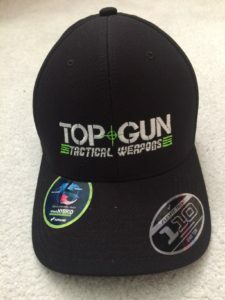 Our Embroidered Baseball cap is fully embroidered with our Top Gun Tactical Weapons Logo on the front and a fully adjustable strap in the rear for a perfect fit. A great way to keep cool and the sun off your head. Please check back with us as we will be adding other items soon.